The apartment is located in Poland in the city of Krakow, very popular and popular because of its many attractions and interesting places like Old Kazimierz, Wawel Castle, Wieliczka, Auschwitz.It offers you a high class apartment. Spacious in a modern complex with a lift on the 1st floor. In a peaceful Neighbourhood. The apartment can sleep 1 - 8 people is large spacious. It is comfortable in the building is the protection. In the complex there is a place to rest the bench. alleys children's playground and recreation center (swimming pool, sauna, jacuzzi, gym) .The apartment is modern fully equipped.It offers you a high class apartment. Spacious in a modern complex with a lift on the 1st floor. In a peaceful Neighbourhood. The apartment can sleep 1 - 8 people is large spacious. It is comfortable in the building is the protection. In the complex there is a place to rest the bench. 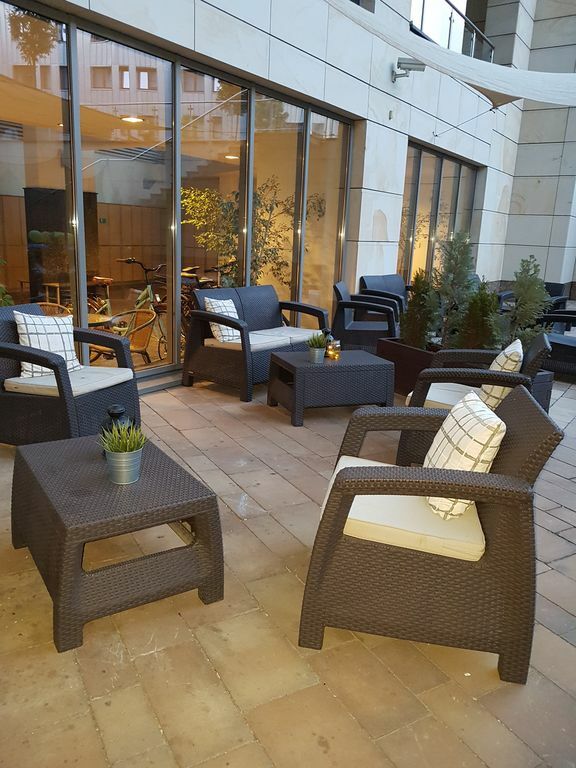 alleys children's playground and recreation center (swimming pool, sauna, jacuzzi, gym) .The apartment is modern fully equipped.The whole area of the apartment is available. In addition, you can use the swimming pool, jacuzzi, sauna and gym located in the complex. You can advertise in peace and quiet throughout the property where in the courtyard there is a recreation area, playground for children, with trampoline. .The apartment is in a very good location. The MPK stop is 50m away. Just 2 short bus stops is 3 min. And we are in the center.Where on the left we have Rynek and Wawel and on the right side Old Kazimierz. Second plus that the airport and the main station will take you to the object with one line. The third plus apartment is neat and well maintained. Fourth plus the opportunity to use on site from the pool, jacuzzy, sauna and gym. Enjoy !! !.Silence and the city's most interesting attractions are within easy reach. The apartment is in a very good location. Only 2 short bus stops (line 184) is 3 min. And we are in the center.Where on the left we have Rynek and Wawel and on the right side Old Kazimierz. The second plus that you will reach the hotel with one line from the airport (line 252) and the main station (line 179). For those who like to spas, you can walk to the Old Town on foot. It will take us about 10min. Kazimierz in Cracow was created by King Casimir the Great himself in the fourteenth century. For many centuries it was a separate royal city, important for the history of Poland. In the twentieth century, it was slightly neglected, but then it blossomed again and attracted by its extraordinary beauty more and more people. In ancient times, the area of ​​Kazimierz was an island, and in the Middle Ages it was separated from Kraków by the Vistula River. Casimir the Great decided to build a new city in this place in order to better protect the capital and yet in his lifetime, the city walls began to be built with towers and gates, which, unfortunately, are no longer present. Can you imagine, how amazing must have looked in the Middle Ages such two great cities? Kazimierz is also famous as an important place in Jewish history. Jews were resettled there in the fifteenth century by the decision of King Jan Olbracht, under the influence of a wave of conflicts and intolerance. A separate district of Kazimierz was created in this way, separated from the rest of the city by a wall. It quickly became an important center of Jewish culture in Poland and in the world, so many outstanding scientists, writers and politicians were born. In the 19th century, Kazimierz was incorporated into Krakow as a new district. The walls were demolished and the Vistula was filled up with the Dietla street in its place. Many of the older residents of Krakow remember Kazimierz as a ruined, somewhat dangerous district even inhabited by poorer populations. Fortunately, those times have already passed, and Kazimierz, with its pleasant atmosphere and slightly mysterious aura, began to attract more and more artists, residents and, of course, tourists. In terms of the number of visitors, it even competes with the Old Town and it also seems that it won with it in terms of the number of cafes, clubs and restaurants. Kazimierz is an exceptionally beautiful district and worth a visit! WHAT TO SEE ON KAZIMIERZ? Thanks to the opening of the footbridge of Father Bernatka on the Vistula to Podgórze, Mostowa Street came to life somewhat and there were many cafes and restaurants - check it out! The houses at Mostowa are from the 19th century and here I have a small curiosity for you: the name "Mostowa"
Mooi appartement. De woning heeft twee kamers met ieders twee bedbanken. Het is heel gunstig gelegen ten opzichte van alle bezienswaardigheden. De auto kan in principe op het terrein van het appartementsgebouw geplaatst worden maar alle plaatsen zijn vaak bezet. Als je auto eenmaal staat kun je hem het beste laten staan. Je kunt makkelijk te voet de stad in maar ook taxi's zijn zeer betaalbaar (enkele reis tussen 5 en 7 euro). De verhuurders zijn goed bereikbaar en het appartement was schoon. Bijna alles is er, tot en met een wasmachine maar het voor Nederlanders noodzakelijke koffiezetapparaat was er niet. Water op korrels gieten dus. In Krakau is echt fantastisch veel te zien. Ook volop restaurants met maaltijden die voor ons erg goedkoop zijn. Vijf sterren voor 2 personen. Voor meer zou ik geen 5 meer geven vanwege de woon- slaapruimte.